The Chariot shares that you can achieve your goal if you will just keep trying. Progress can be made now – obstacles overcome and success gained through personal dynamism. Control your emotions and your dreams will come true – remove all the obstacles so you will have the vision to move forward. You are due recognition and honor – harness all your energy and apply it wisely so that you will be able to make your point. Allow your soul to direct your body – be receptive to both the negative and the positive – control and balance them. Rest now, reflect and turn inward for analysis, solitude, health and physical completion without effort. Issues are coming to a head – maintain control – wait, listen and avoid pushing your affairs. Accept that you are “in” the world but not “of” the world – find the “force” within you through a quiet and receptive state of mind. “Ego” is your conscious mind, your physical self-image – it forms the “surface” identity which directs your views and focus – it is a vehicle used to express your soul. Your ego continually changes as your beliefs about yourself change – it successfully controls a situation, but never brings the contradictions together so that they can be resolved. Trust and work in harmony with your “way” and you will reach your goal. Honor your achievements and dedicate yourself to even higher successes. Harness all your energies toward your purpose – you will experience true victory once your spirit has found a focus through which it can release its total force. Shut out what is keeping you from reaching your goals. Once your lessons have been absorbed and you have become a mature adult – successful in life, admired by others, confident and content with yourself – able to control your feelings and direct your will as your strong character controls the opposing forces of life. No longer a victim of your emotions – your sexuality contributes to a satisfying life as your mental energy directs your passions and controls your instinctive desires. Individualization is the gradual birth of another “self” higher than your “ego” self. As you mature – you create a kind of mask to deal with the outside world. If you have dealt successfully with the various challenges that life has presented you – then these different aspects will become integrated into your “ego” mask. You can easily confuse this successful persona with your “true” Self (a high opinion of yourself which is not justified – an exaggerated desire to have your own way or an exaggerated importance of “self”). If this occurs – then the removal of this mask will create the fear that its removal could possibly result in death. Challenge yourself and with the heart, will and courage of a warrior – exorcise your inner demon of fear which is the greatest obstacles to life and growth. Recognize that you are receptive and sensitive to emotions – you “mirror” the actions and emotional feelings of those around you. You have put on a mask of detachment for your own self-protection. Imagine yourself beyond human limitations. “Speech” restricts your experience of reality, it forms a description of the world and gives everything a label. When you accept this “label”, you actually erect a barrier between yourself and an experience. This “label” replaces the thing itself – when you see a tree, you think “tree” and move on – rather than allowing yourself to experience the impact of this wonderful living organism. As you come to rely on this rationality – you will begin to ignore experiences that cannot be expressed in words. Always remain conscious of the “distance” and “difference” between your human consciousness and the Divine consciousness – for only in a state of humility will God draw near to you. Physical ways and means of extending your physical package, your physical growth. The wheels for the Empress. Physical transportation or movement, travel, relocation. Physical strength and capability, prowess, construction. Physical action taken to increase your personal package. Physical extensions of self and support in your environment. Material aids to achieving goals. Building and feathering the nest. Asserting physical independence. Creating your personal, physical world as a laboratory for your life’s work. Getting things done on the Material Plane. Efforts to improve your health, especially your physical condition. Change and control, financial investment, physical investment of time and energy. Harnessing of energy to appropriate physical needs. To achieve anything one must somehow harness the extremes of opposites, of dualities. This chariot will not go where the left horse would take it, nor where the right horse would take it – but where we steer it – straight ahead down the middle of the path. Consider these two horses temperance and temptation – one steering you back, the other pushing you forward. In the first position: This lifetime is to be centered on growth and enrichment. You have a lot to accomplish in the hard reality of the Physical/material plane. There should be much social activity as well as business and trade. This is a path of increase in the foundation of the self to include the well – being of others under its mantle of protection. Here is assumption of responsibility for a self that includes others. 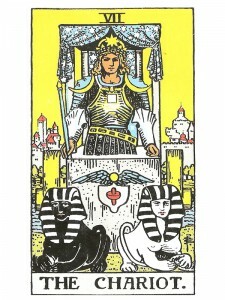 In the second position: Here is the Chariot card in the position of the Chariot and so it is very centered and strong. Do you own your own trucking company or run your own construction company? It would seem that you have the resources and the ability to do what needs doing. The strongest of foundations has been laid for the accomplishment of your Karmic Contract. In the third position: The time is appropriate and the means are at hand for growth. A major step forward and outward. In the fourth position: These are the tapes of a very impressionable youth, eager to adopt heros and heroines of larger than life proportions. The more exotic and far reaching the better, such as science fiction. The underlying fascination here is in the figure/idol who is so physically strong that he/she can always get the job done, so that everyone ends up not only secure, but with more than they started out with. In the fifth position: You are considering means of expansion, with detailed plans reviewing resources and logistics – a concrete strategy is necessary. In the sixth position: Your near future will see an expansion in your emotional house, a physical opening and inclusion of greater numbers, greater activity. You will be physically more demonstrative. In the seventh position: Here is an assertion of self that is fully appropriate. A broadening of your mind, your plans, your beliefs, with a willingness to be outspoken about your conclusions. A decision to go for it. In the eighth position: Movement is underway or will be in the near future. Things such as home or job relocation make their appearance here. If one can actually see growth it is visible under these circumstances. In the ninth position: You are opening up to the need for growth and to the means to achieve it, to the tools that are available or being offered, to new processes. In the tenth position: Here is a gentle message to get moving; the status quo has reached its limit. If you take action now, the ball will be in your court. Wait and others will be doing the acting and you the reacting. This is grace offering an extra push/pull, the needed physical assistance to help you get things started. I love your spiritual interpretations of the cards, so profound and true! Thank you! Diana, this site is such a blessing. Thank you for all your hard work and dedication. I am in no doubt that your insightful words are a light shining in the darkness for many. They certainly have been for me. I hope one day to see your guides in print. I would love to have a copy of them on my bookshelf. Thanks for taking the time to share this info, I love reading more on this. Thanks for spending the time to share this, I really feel strongly about it and love reading more about this. Keep updating your website with more information. I just wanted to say thank you for building and maintaining this site. I use it often, and could have said thank you before now, but I saw that you replied to a recent comment on this page yesterday, so you’re obviously still monitoring things here. I’m neither an expert nor a devotee of tarot. Just curious and interested. This is just a massive thank you from someone who can’t yet afford to show his gratitude in a more material way, and to let you know that your effort is very much appreciated. With four major cards in your reading … you have a great deal of spiritual help with your current and future situations. You may have to make a touch decision, but feel confident that they will help get you to where you need to be. Hi Diana… I asked about my future and got this card in the tenth position, using the Celtic Card spread. I am not sure what to make of it, but I hope it is not a warning sign in this case scenario. Could you please offer me insight on my reading? (Card 1: Five of Pentacles, Card 2: Seven of Cups, Card 3: Three of Cups, Card 4: Ten of Swords, Card 5: The Fool, Card 6: The Lovers, Card 7: The Hierophant, Card 8: Ace of Pentacles, Card 9: Nine of Pentacles, Card 10: The Chariot). I appreciate any insight you have to offer.